In this edition of Sox Grades, Jordan and Jeremy continued their trip around the infield. They took a look at several players who carried the Boston Red Sox during the postseason with timely hits or protected one of the most feared hitters in baseball during both the regular season and playoffs. For a utility infielder, Brock Holt did exactly what he was supposed to do. The problem was, he wasn’t as much of a utility infielder as I’m sure the Red Sox expected him to be. Injuries forced him into long stretches of starting, and while I know it isn’t fair to hold that against him, but he was still exposed like he has in past years. He simply is not a starting caliber player; he works best in the utility position, resting a lot and coming in for spot starts. Coming down the stretch, Holt was on a tear, especially pinch-hitting. But for some reason, Alex Cora chose not to use him as much in that role. Oh, and before I forget, that “cycle” that he hit for in the ALDS needs to get an asterisk on it. Jordan: People re-fell in love with Brock Holt in 2018, thanks in large part to arguably the cutest child in the world: Griff. But putting Griff aside for a moment, Holt was no slouch either. I feel awful about talking about how bad he was in 2017, then it occurred to me that maybe vertigo was inhibiting his ability. I never was one of those fans pulling for Devin Marrero to play over Holt, but I didn’t expect much from Holt in 2018. Boy, was I wrong. At times, this guy was the best hitter in the lineup; and was one of the best pinch-hitters in the game –– going 2-5 with an OPS of 1.621 in seven plate appearances. The world needs more of Holt, especially if he keeps posting those videos of Griff (he’s back). But based on performances, Brock Holt definitely did more than keep up his share of the bargain. Jeremy: The thing I took from Rafael Devers’ season the most is that I need to get in touch with his dermatologist to find whatever skin cream he uses to highlight the baby fat in his cheeks. It’s scary to think how young this kid is, and the potential he still has to unlock. Most people were disappointed with the output Devers put out, but compared to other young third basemen he wasn’t that far off, especially when looking at him and Miguel Andujar. Both could mash, and both couldn’t defend to save their lives. Devers is the anti-Jackie Bradley Jr. He needs to figure out the glove, and be a marginal defender to be a star in this league. But he was too inconsistent and couldn’t make up for it because of his limited playing time in the playoffs, due to what? His trash defense. Jordan: I know I’m not the only one disappointed with the performance of Rafael Devers in 2018. Everyone, myself included, could’ve looked at how poised he was in the ALDS in 2017 and said: “We’re witnessing a young star emerge.” However, it was unfair for some to predict that 30 home runs were in the immediate future. Guys struggle; and in Devers’ case, it had him sent to the DL twice in order to get him more swings in AAA without using an option. It worked out in the end because he was full of the timely hits in the playoffs; most notably the three-run shot he hit off of Justin Verlander in the ALCS-clincher. However, he still looks lost at times on both offense and defense. The Red Sox are loaded at the corner infield spots in the minor leagues, meaning Devers is going to have to right the ship at some point this year. However, I think he can still be a very productive bat at the MLB level, and a serviceable defender at third base. 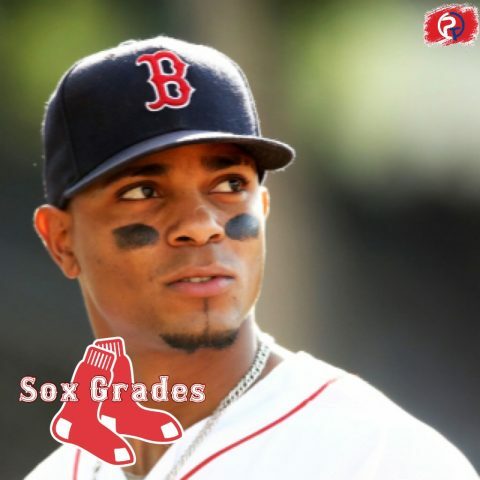 Jeremy: This is the Xander Bogaerts we expected last year. All the important offensive statistics except for average went up this year. The reason for this? He was protecting the most dangerous DH in the league, JD Martinez. His power numbers were all up, and he had perhaps the most important job on the Red Sox. The Red Sox would not have won the World Series without Xander Bogaerts. So what if he’s a Scott Boras client? Pay the man. He’s the best shortstop since Nomar and has rivaled other AL shortstops like Carlos Correa and Francisco Lindor. These types of players don’t grow on trees. Jordan: I guess you could sum-up Xander’s season in one hyphenated word: Career-high. When you look all over his stats, they were all the best they’ve ever been. Home runs, career-high. RBI, career-high. OBP, SLG, OPS, all career-highs for Bogaerts. Oh, and he hit three grand slams in 2018 –– three more than the Red Sox hit in 2017. The defense I’ve learned to live with, as he was the worst shortstop in baseball in terms of defensive runs saved among qualifiers; but I feel like he makes most of the plays he needs to make. Plus the offense is at an all-time high for him. He propelled himself back into the elite category for shortstops in 2018. I loved what I saw, now just translate it to October.